I love it when I stumble across a new young adult fantasy! And this one has it all. There are a variety of characters from different backgrounds all seeking to pass a test so that they can keep their magic. We really get to know some of these characters as the point of view does jump between a few of the main ones. 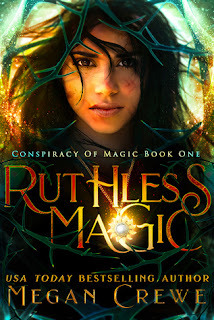 RUTHLESS MAGIC is really a coming of age story. Everyone is old enough that they had applied to one of the magical colleges and were refused. Now they have to dig deep into themselves and make some unlikely allies to be able to survive. Along the way, they uncover some information that will cause them to wonder if they really want to succeed. I really think that any reader who enjoyed Harry Potter would enjoy stepping into this new world of Ms. Crewe. I devoured this book in one day and am now rather impatiently waiting for the next in the series.